The following is an excerpt from a forthcoming academic paper, the whole of which will be published in 2014. I’m researching the methods by which songwriting teams collaborate. In my analysis of the way Livingston and Evans wrote ‘Mona Lisa’ , I’m observing the various factors that influenced the writing and eventual musical/lyric content of the song. Words: Joe Bennett (c) 2013. 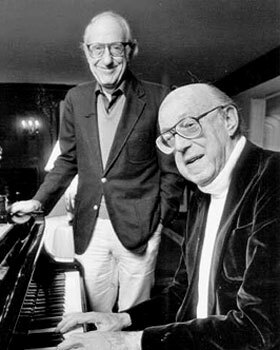 Jay Livingston and Ray Evans became a collaborative songwriting team in 1937 and enjoyed a 64 year creative partnership. They specialised in songs for films, and their work was recorded by many of the USA’s most successful singers, particularly in the pre-rock ‘n’ roll era, including Bob Hope, Debbie Reynolds, Johnny Mathis, Doris Day and Peggy Lee. Their hits include Que Sera, Sera, Buttons and Bows and Silver Bells. We had to write an Italian song. It was a picture called OSS, which was the CIA during World War II. Alan Ladd was in a little Italian town, and they wanted some way of warning him that the Nazis were coming with a patrol. He was there with a little radio and the partisans, and they [the film company] said, ‘Why doesn’t somebody play a song on an accordion, a street guy.’ He was blind but he could really see, and he’d start playing this song and that would warn Alan Ladd. …[the film studio] said that [the Mona Lisa melody] sounded Italian and they liked it. Here, the constraints of the brief are imposed by the client, Paramount Pictures, who has pre-specified several characteristics for the song. It must ‘sound Italian’; it must be melodically strong, and implicitly recognisable after only a few accordion notes, given its intended role in the film’s plot. If it had broken any of these constraints the client would have exercised veto and either demanded a rewrite or commissioned a different songwriting team. These requisite musical characteristics were therefore imperatives for Livingston and Evans: they were economically forced to obey the specified constraints without which the song would not have been approved or released. Is it only / ‘cause you’re lonely / they have blamed you? For that Mona / Lisa strangeness / in your smile? Do you smile to / tempt a lover / Mona Lisa? Or is this your / way to hide a / broken heart? Or just a cold and lonely / lovely work of art? The melody of the whole song is structurally rather unusual. It lasts for only 20 bars and although it appears (due to its opening title placement at the start of verse 1) to begin as a predictable AABA standard, it abandons this form somewhere around bar 10, leaving the verse 2 melody to metamorphose, I suggest, into an extended outro that builds to the final melodic resolution provided in the line ‘lovely work of art’. Both songwriters attested to their preferred usual adherence to 32-bar form, and described their deviation from it in Mona Lisa as intentional because the lyric had ‘nothing more to say’. Of course, we didn’t like ‘Primadonna’ as a song. He [Evans] came up with the title ‘Mona Lisa’ the next day. The partnership had therefore reached an agreement that the four-syllable title melody – indeed, the whole melody derived from it – would not be adapted further. 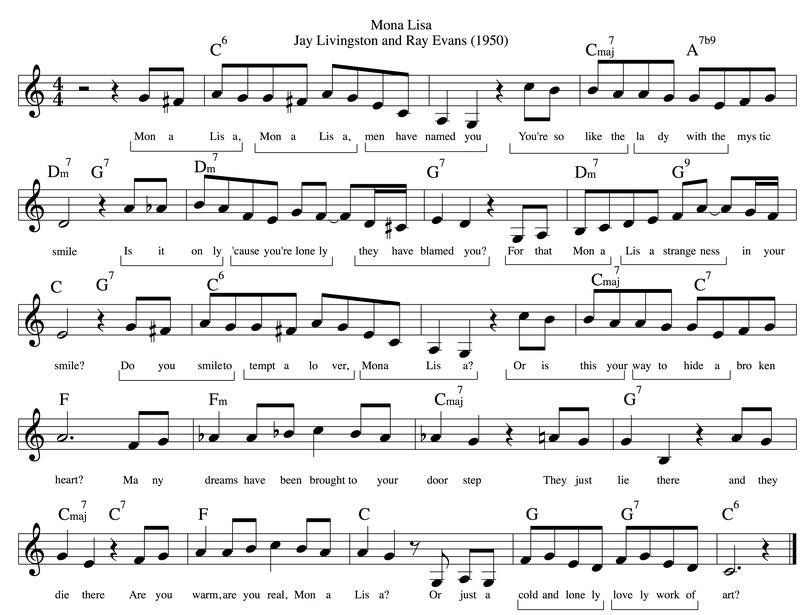 The lyric was then fully completed by Evans, presumably in the ‘final’ version that eventually become the definitive Mona Lisa hit (neither Livingston nor Evans allude to any subsequent lyric edits). However, at this point the client intervened, creating new commercial constraints (a change of title for the film) that demanded a rewrite. Livingston and Evans, ever the jobbing professionals, obliged and provided what was required. They loved title songs because it sold their picture. I’m so restless, are you restless after midnight? Did we leave the candlelight, the wine too soon? Do you lie awake as I’m awake this midnight? Does the tick-tock of the clock seem much too slow? We can see here the exact preservation of the melody, and its implicit pride of place in the song’s hierarchy; both the client and the collaborative team had clearly decided that the melody was finished (probably in part because it had already successfully circumnavigated the client’s veto by meeting the specification that it must ‘sound Italian’) and were working to find a lyric to fit the constraints of the new commercial brief. The eventually abandoned After Midnight lyric sings extremely well, with a minimum of sibilant and plosive consonants, natural-sounding syllable scansion, and strong vowels in every adjective and noun. To me as a listener, subjectively and with the benefit of hindsight, After Midnight is a weaker lyric. The protagonist’s single-bed reflections on his moonlight-and-wine date are well crafted and tell the song’s story, but the imagery is predictably genre-typical and less new or surprising than the questioner’s unusual and enigmatic speculation in Mona Lisa. We liked Mona Lisa. We didn’t think it was a hit, but it was pretty. But they wouldn’t change it. They wanted that title song [After Midnight]. They made a demo with a 44-piece Paramount orchestra of After Midnight, which means that’s the end of Mona Lisa. This sequence of events shows Livingston and Evans combining creative self-belief (their preference for the original Mona Lisa lyric) with music industry awareness (the need to ‘get their song back’ in copyright terms) production-chain pragmatism (asking a favour to ensure a demo was made), reputational professionalism (achieving all of this without upsetting their client) and economic reasoning (ensuring their song still appeared in the film whilst being suitable for commercial release). Stimulus processing occurs between the co-writers in a linear fashion; Livingston initially agrees to write a melody in response to Evans’s working title Primadonna. The partnership then evaluates the title in its melodic context and agrees to replace it, keeping the melody fully intact. From the limited evidence base provided by retrospective interviews, veto is not apparent within the partnership, partly perhaps because the co-writers’ roles are so clearly demarcated into music and lyric duties, and because the partnership was, by 1949, more than 10 years old. The co-writers encounter two types of constraint – those they impose themselves (the four-syllable title constraining Livingston’s melodic work, and, later, the finished melody constraining their collaborative lyric work), and those that are imposed upon them (the ‘Italian feel’, instant recognisability and title changes required by the client). They are also constrained by the song form conventions of the era, although in this case they choose to break with (AABA) form – implicitly in service to the melody, and as they later reflect, perhaps also to avoid stretching the lyric theme too thinly. Who are the true creators of Mona Lisa? There is no doubt that Livingston and Evans are credited as such (e.g. in ASCAP’s records), and that Livingston wrote the music and Evans the lyrics (with collaboration from Livingston). But it is also true to say that this powerful and enduring standard would not sound the way it does today were it not for the creative constraints imposed by Paramount Pictures – before, during and after the original songwriting session. The client’s implicit veto played a significant role, because it preserved the melody throughout the various lyric edits, and also because Livingston and Evans would have been industry-aware enough to know what not to write for a commercial film studio client. For example, they would not have considered writing a song where the title did not appear prominently, given the contemporaneous assumption of cross-media selling of a song in film and audio recording markets. Livingston freely admits that he took the idea of composing a theme from a four-syllable word from Russell and Sigman (Primadonna from Ballerina). And what of the unidentified Italian composers who created accordion melodies involving flattened fifths and maudlin pentatonic descents that the client (and Livingston) heard in the melody? To stretch the thread of artistic influence further, did Leonardo Da Vinci influence the songwriting by creating a painting whose enigmatic facial expression inspired the narrator’s speculation in Evans’s lyric? Should its sitter, Lisa Gherardini, be considered to be partly responsible for the song, given that her likeness and expression inspired the painting that inspired its lyric theme? Or are all of these influences simply bisociative links, with Evans and Livingston being ‘creative’ only to the extent that they successfully select, combine and adapt these raw materials? Although some of these questions are deliberately facetious, they do demonstrate the researcher’s ‘anxiety of influence’ in establishing all the contributory factors to a song’s content, given the many cultural and industrial factors in its creation. Interestingly, a 2013 Google search for the text string ‘Mona Lisa by’ is autocompleted by the search engine with the top two suggestions being ‘Nat King Cole’ followed by ‘Leonardo Da Vinci’. We can conclude that, in the data-driven worldwide ‘hive mind’ of Internet search engine users at least, Mona Lisa is ‘owned’ by Nat King Cole – the artist who first recorded it . Mona Lisa demonstrates that Livingston and Evans were, by 1949, an experienced co-writing team with an awareness of market demands, absorption of songwriting convention and contemporaneous repertoire, and a willingness to negotiate – with each other as co-writers, and with their paymasters. Their successful navigation of these challenges among ever-changing industrial and artistic constraints is evidenced in history by the song’s demonstrable endurance as a ‘standard’. The co-writing process shows evidence of cultural influence and commercial intervention. These factors inform collaborative creative endeavour, enabling the co-writing team to pitch their work via industry gatekeepers to a Field of music consumers. Mona Lisa survived the Field’s filters and became a co-written classic – and I contend that the unromantic circumstances of its birth do not prevent it from being a ‘lovely work of art’. I would like to thank Jay Livingston’s son-in-law and publisher Randy Talmadge for proof-reading this article and for providing additional information about the Livingston/Evans partnership. Carter, Writing Together : the Songwriter’s Guide to Collaboration, 77. Nat King Cole, Mona Lisa, CD, vol. Nat King Cole – the Ultimate Collection (Capital 2008), 1950, http://open.spotify.com/track/3KC5yrPGuw8NFjtCBt5qOZ. The Cole recording sounds in Db major – transposed here to C major for clarity. I use solfège to describe these notes purely for wordcount convenience and clarity. The syllable se refers to a flattened sol (fifth). The notation is a reductive compromise in terms of timing; Cole’s vocal stretches the timing of the last two syllables of each four considerably, and so not all four-syllable groups are notated as quavers in my transcription. Copyright footnote: I claim academic Fair Use when providing this annotated 21-bar excerpt. It is reproduced here for scholarly non-commercial purposes only. This reductive transcription represents the topline only and serves to illustrate my discussion of melodic and lyric phrasing in the work. Ballerina by Sidney Keith Russell and Carl Sigman. Published in 1947; hit recordings include Vaughn Monroe 1947, Bing Crosby 1948, Jimmy Dorsey 1948 and Nat King Cole 1957. Zollo, Songwriters on Songwriting, 18. Carter, Writing Together : the Songwriter’s Guide to Collaboration, 77. Actually the title was suggested by Ray’s wife Wyn. Jay Livingston, Mona Lisa by Nat King Cole – Songfacts, August 1988, http://www.songfacts.com/detail.php?id=6552. Carter, Writing Together : the Songwriter’s Guide to Collaboration, 77. I have underlined the four-syllable phrases as they appear in Mona Lisa for clarity. Heidelberg University library, “Mona Lisa – Heidelberg Discovery Confirms Identity,” 2005, http://www.ub.uni-heidelberg.de/Englisch/news/monalisa.html. We can perhaps also conclude that a famous pop song attracts more per-click cultural interest than the world’s most celebrated work of fine art.